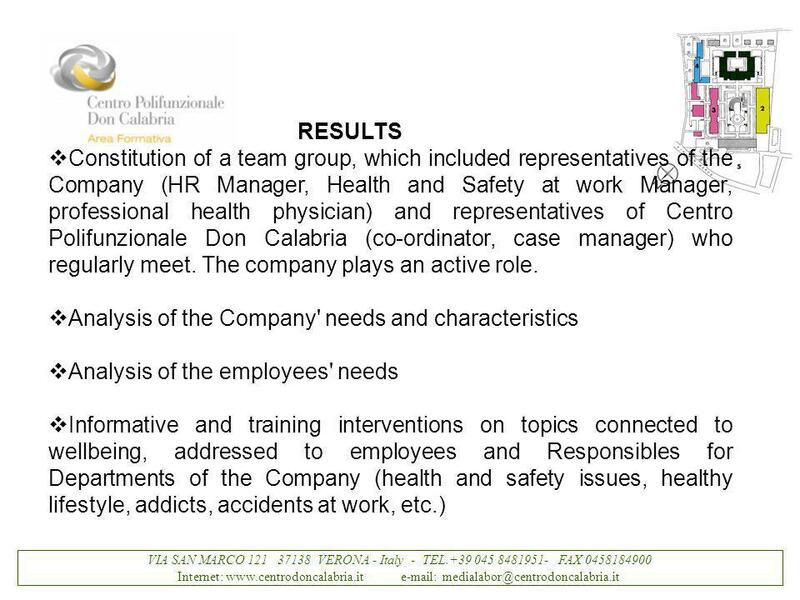 5 VIA SAN MARCO 121 37138 VERONA - Italy - TEL.+39 045 8481951 - FAX 0458184900 Internet: www.centrodoncalabria.it e-mail: e-mail: medialabor@centrodoncalabria.it People with mental and/or physical disability and traumatic brain injury (in-patient or out-patient) Persone con disabilità intellettiva,psichica e/o fisica e con esiti di trauma cranico provenienti da altre aree del Centro Don Calabria o dal territorio. 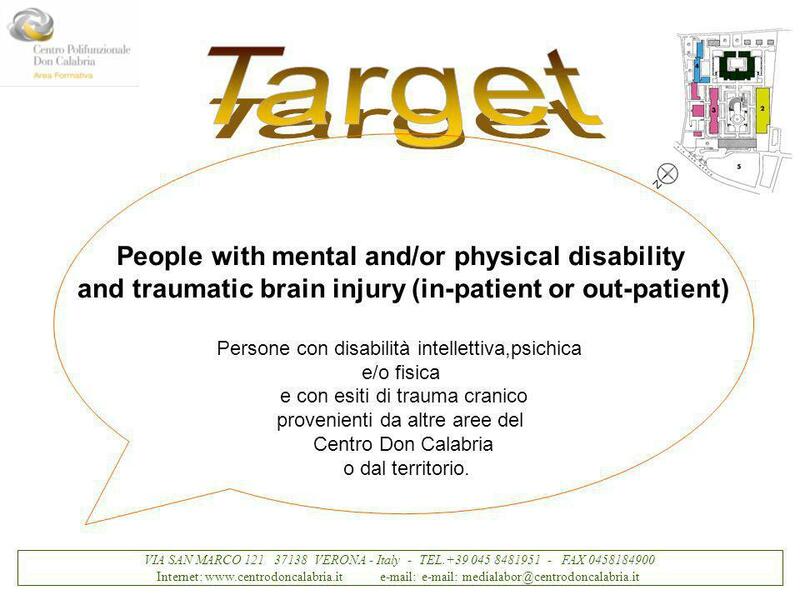 8 VIA SAN MARCO 121 37138 VERONA - Italy - TEL.+39 045 8481951- FAX 0458184900 Internet: www.centrodoncalabria.it e-mail: medialabor@centrodoncalabria.it CONTEXT, POPULATIONS & NEEDS The new trends of the Welfare State and the social cuts that every country in Europe has to face lead to the necessity of a different approach towards people who acquire a disability during their work life. 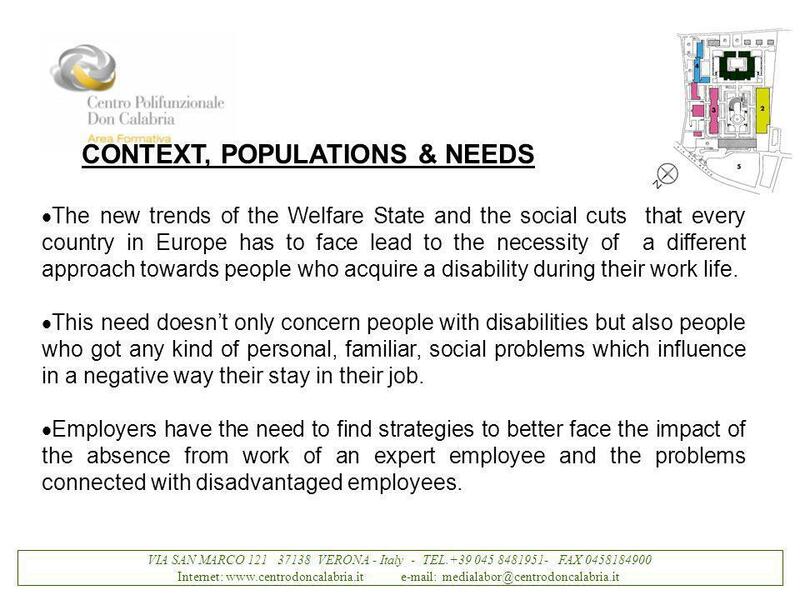 This need doesnt only concern people with disabilities but also people who got any kind of personal, familiar, social problems which influence in a negative way their stay in their job. 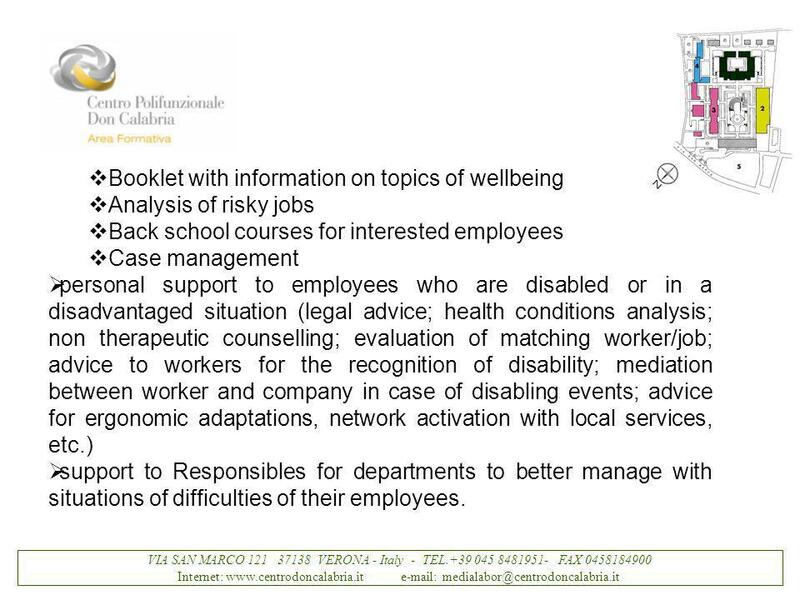 Employers have the need to find strategies to better face the impact of the absence from work of an expert employee and the problems connected with disadvantaged employees. 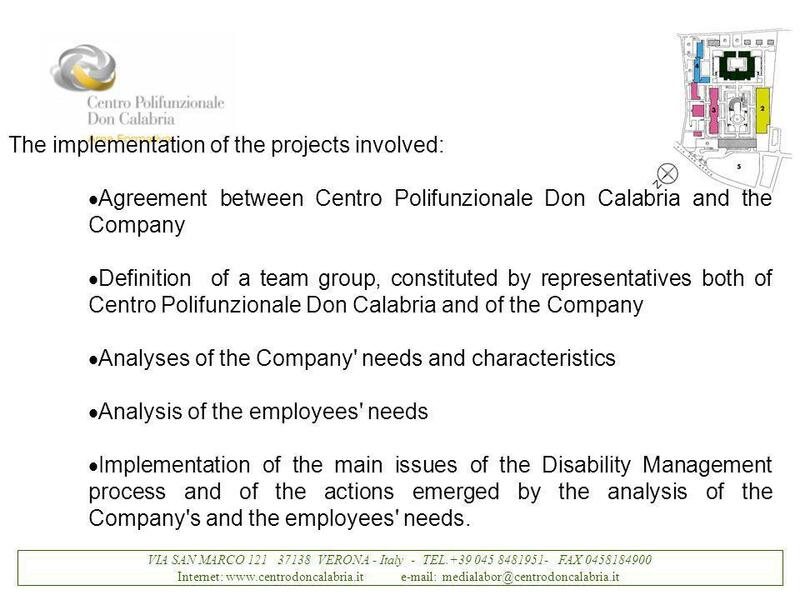 9 VIA SAN MARCO 121 37138 VERONA - Italy - TEL.+39 045 8481951- FAX 0458184900 Internet: www.centrodoncalabria.it e-mail: medialabor@centrodoncalabria.it OBJECTIVES Disability Management is an active process of minimising the impact of an injury, disability or disease on the workers capacity to successfully perform his or her job. 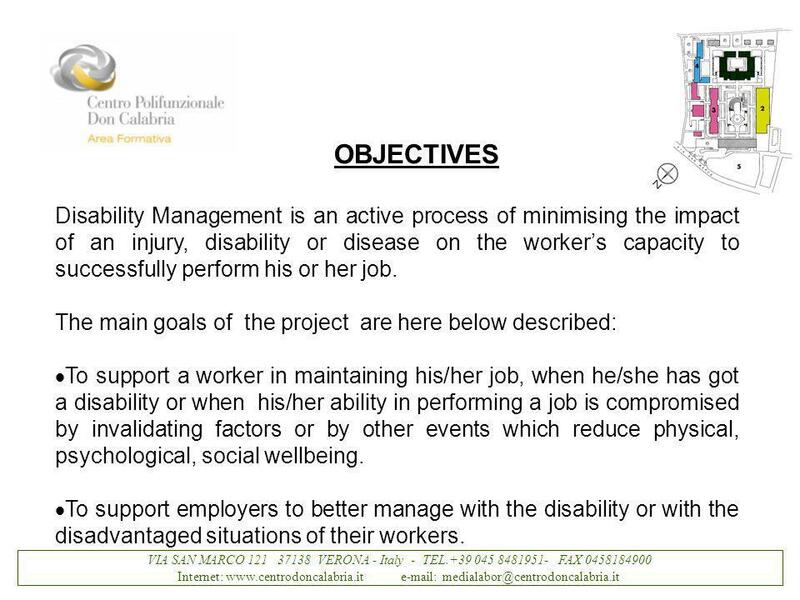 The main goals of the project are here below described: To support a worker in maintaining his/her job, when he/she has got a disability or when his/her ability in performing a job is compromised by invalidating factors or by other events which reduce physical, psychological, social wellbeing. 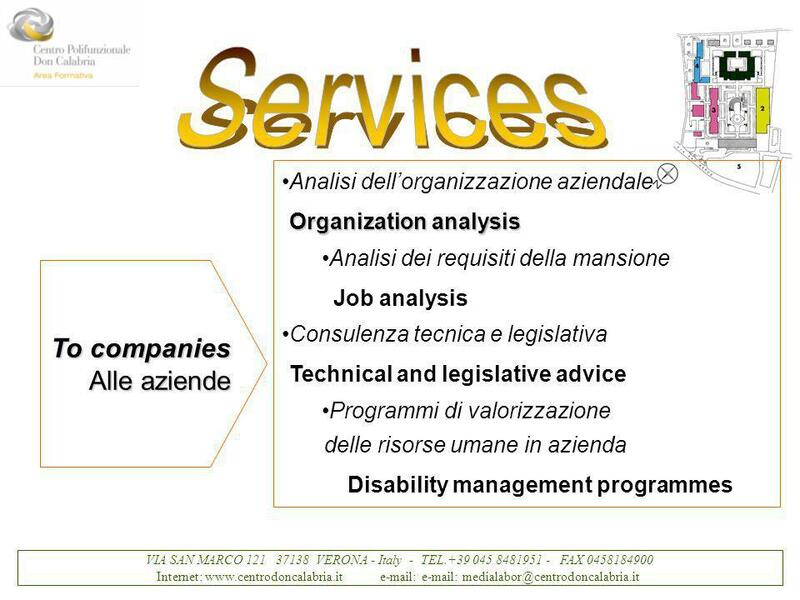 To support employers to better manage with the disability or with the disadvantaged situations of their workers. 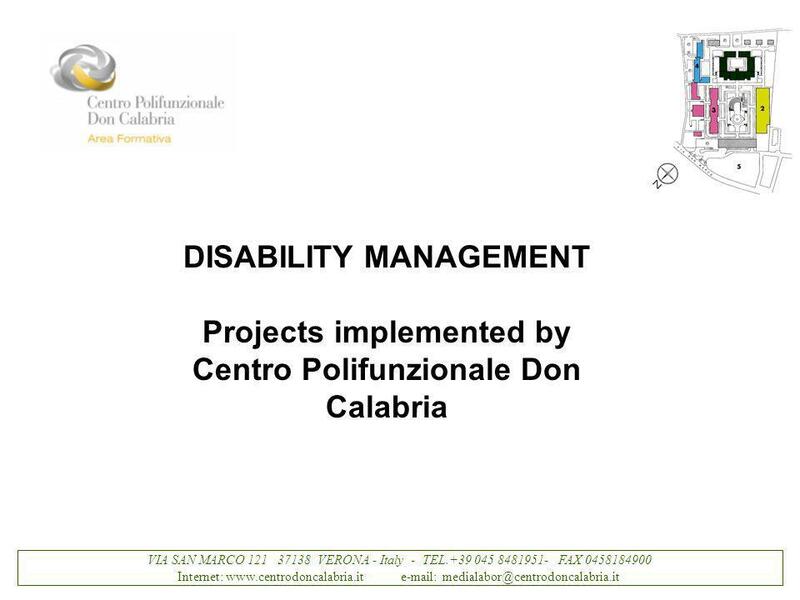 11 VIA SAN MARCO 121 37138 VERONA - Italy - TEL.+39 045 8481951- FAX 0458184900 Internet: www.centrodoncalabria.it e-mail: medialabor@centrodoncalabria.it The implementation of the projects involved: Agreement between Centro Polifunzionale Don Calabria and the Company Definition of a team group, constituted by representatives both of Centro Polifunzionale Don Calabria and of the Company Analyses of the Company' needs and characteristics Analysis of the employees' needs Implementation of the main issues of the Disability Management process and of the actions emerged by the analysis of the Company's and the employees' needs. 12 VIA SAN MARCO 121 37138 VERONA - Italy - TEL.+39 045 8481951- FAX 0458184900 Internet: www.centrodoncalabria.it e-mail: medialabor@centrodoncalabria.it This led to interventions on -wellbeing promotion -preventive measures -early interventions (when possible, according to National Legislation) -case management of specific situations of some employees who were in a discomfort condition and requested the cooperation with a network with local Services. 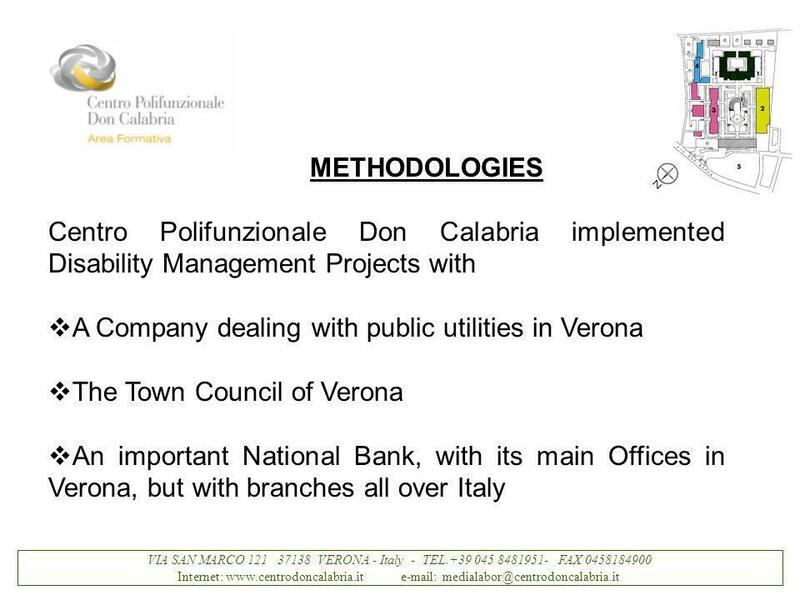 13 VIA SAN MARCO 121 37138 VERONA - Italy - TEL.+39 045 8481951- FAX 0458184900 Internet: www.centrodoncalabria.it e-mail: medialabor@centrodoncalabria.it EXPECTED OUTCOMES & SUCCESSFUL CRITERIA Promote health and safety policy in the Company Build up a network with the local Services, dealing with health and wellbeing promotion, risk and industrial accident prevention Improve the relation between the Company Management and the employees Support the employees in overcoming difficulties, which can arise, in order to facilitate a successful stay in their job or a quicker return to work. 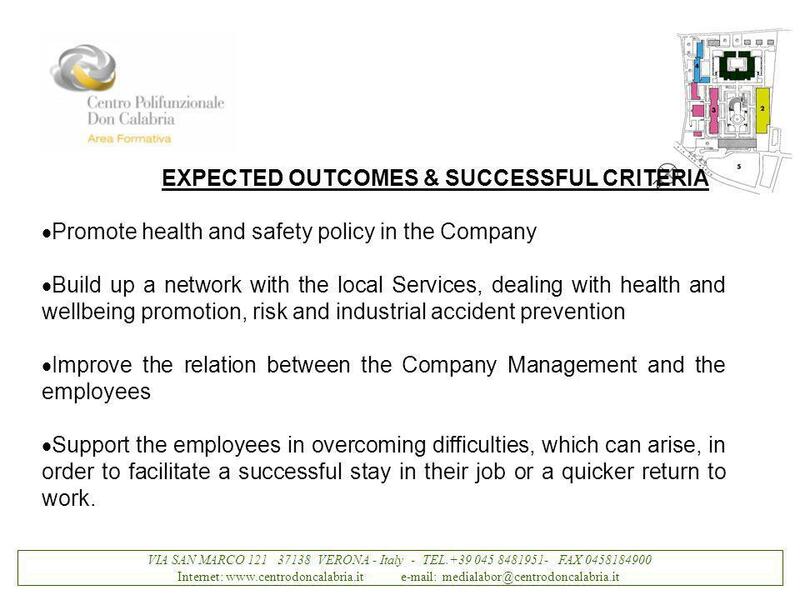 14 VIA SAN MARCO 121 37138 VERONA - Italy - TEL.+39 045 8481951- FAX 0458184900 Internet: www.centrodoncalabria.it e-mail: medialabor@centrodoncalabria.it EXPECTED OUTCOMES & SUCCESSFUL CRITERIA Give tools to the Responsibles of offices, departments of the Company to better manage with disadvantaged situations of their employees Support the Company in minimising the negative effects related to the absence of an employee. This includes: early intervention to facilitate a quicker return to work, temporary lighter jobs, Vocational rehabilitation, re-training, ergonomic adaptation, job carving, etc Reduce the social costs connected with the absence from work of an employee. 15 VIA SAN MARCO 121 37138 VERONA - Italy - TEL.+39 045 8481951- FAX 0458184900 Internet: www.centrodoncalabria.it e-mail: medialabor@centrodoncalabria.it STAFF & OTHER RESOURCES The team groups consisted of: representatives of Centro Polifunzionale Don Calabria (co-ordinator, case manager,) representatives of the Company (HR Manager, Health and Safety at work Manager, professional health physician) Other resources were involved, related to the specific actions implemented (Representatives for National Institute for Insurance against Industrial Injuries, Experts in addictive substances, Representatives for the local Service for health and safety in the work environment, etc.). 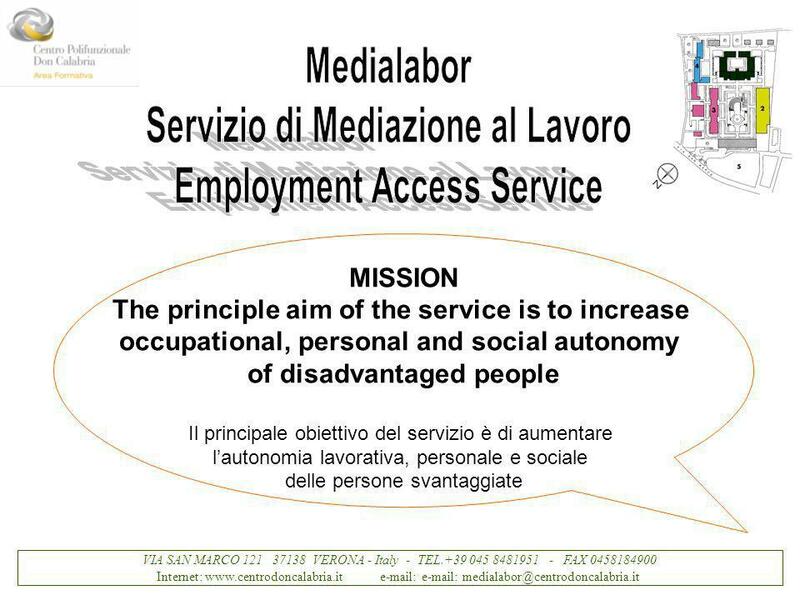 17 VIA SAN MARCO 121 37138 VERONA - Italy - TEL.+39 045 8481951- FAX 0458184900 Internet: www.centrodoncalabria.it e-mail: medialabor@centrodoncalabria.it Booklet with information on topics of wellbeing Analysis of risky jobs Back school courses for interested employees Case management personal support to employees who are disabled or in a disadvantaged situation (legal advice; health conditions analysis; non therapeutic counselling; evaluation of matching worker/job; advice to workers for the recognition of disability; mediation between worker and company in case of disabling events; advice for ergonomic adaptations, network activation with local services, etc.) 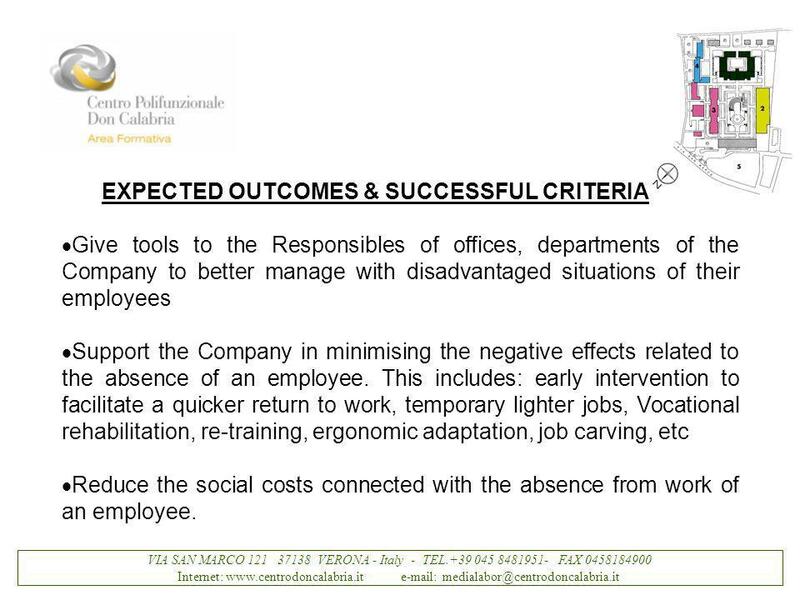 support to Responsibles for departments to better manage with situations of difficulties of their employees. 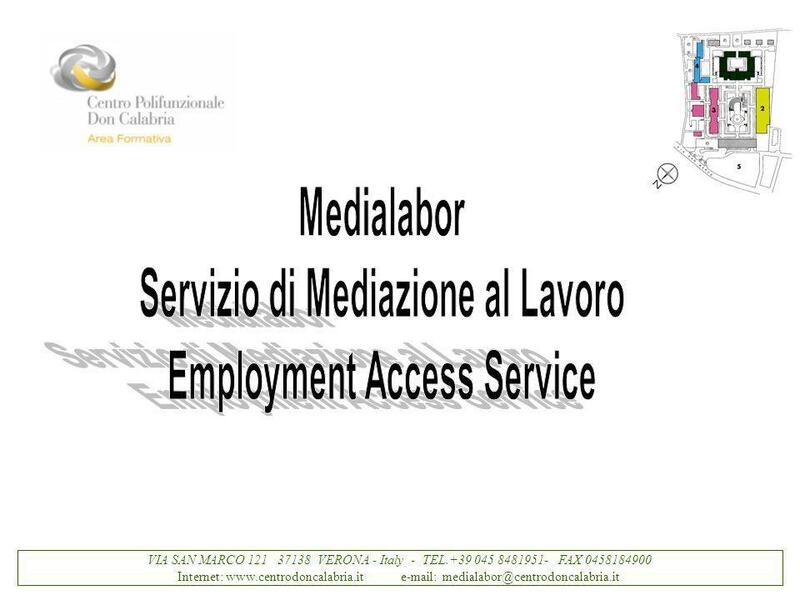 18 VIA SAN MARCO 121 37138 VERONA - Italy - TEL.+39 045 8481951- FAX 0458184900 Internet: www.centrodoncalabria.it e-mail: medialabor@centrodoncalabria.it The service of Case Management was delivered with the purpose of reaching the following objectives: Facilitate problem definition Facilitate the identification of internal resources of the individual to solve the problem Verify and promote the possibility of adaptation of the work environment, connected to the defined problem and according to the main principles: Principle of self-determination and active participation of the worker in problem solving Principle of professional secrecy Principle of network activation to solve the problem. 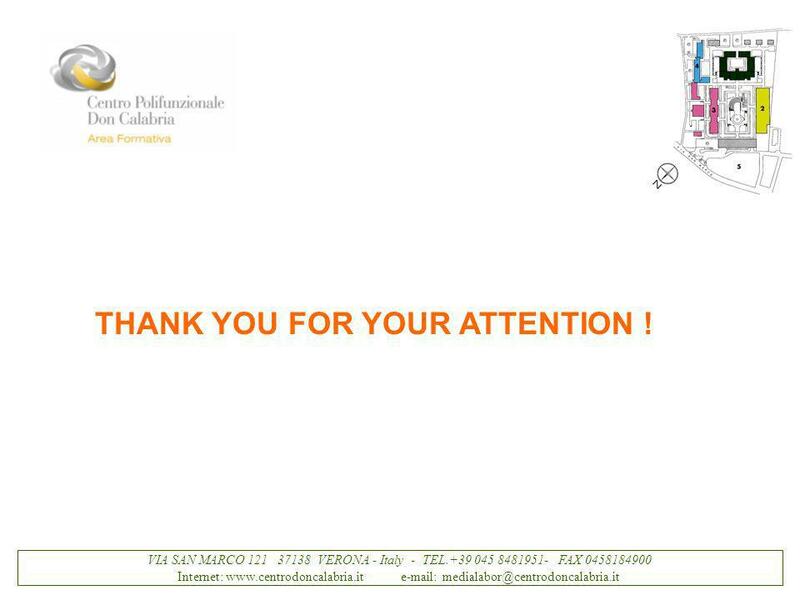 20 VIA SAN MARCO 121 37138 VERONA - Italy - TEL.+39 045 8481951- FAX 0458184900 Internet: www.centrodoncalabria.it e-mail: medialabor@centrodoncalabria.it THANK YOU FOR YOUR ATTENTION ! 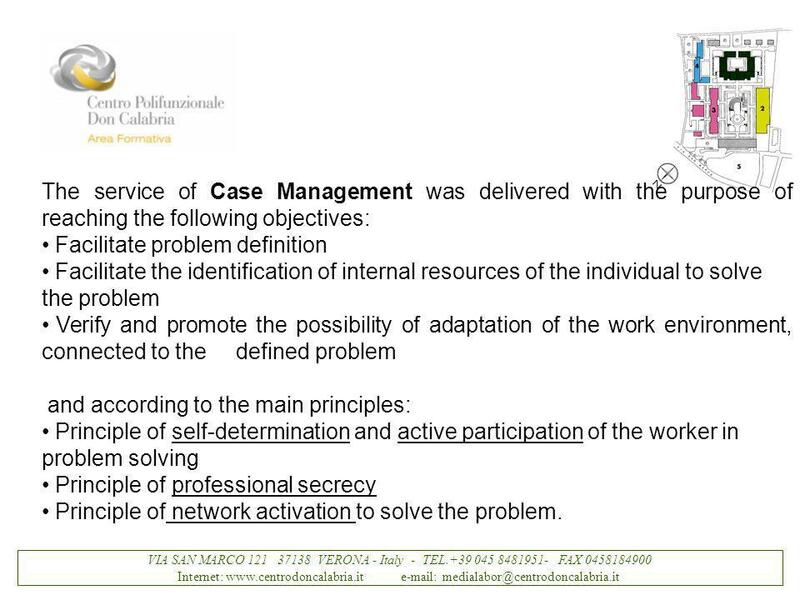 Download ppt "VIA SAN MARCO 121 37138 VERONA - Italy - TEL.+39 045 8481951- FAX 0458184900 Internet:"
Abilities Management Access/Lifestyle Health Coaching June 18, 2012. Disability Management PSAC National Health & Safety Conference 2013 Mental Health at Work – We Are All Affected. 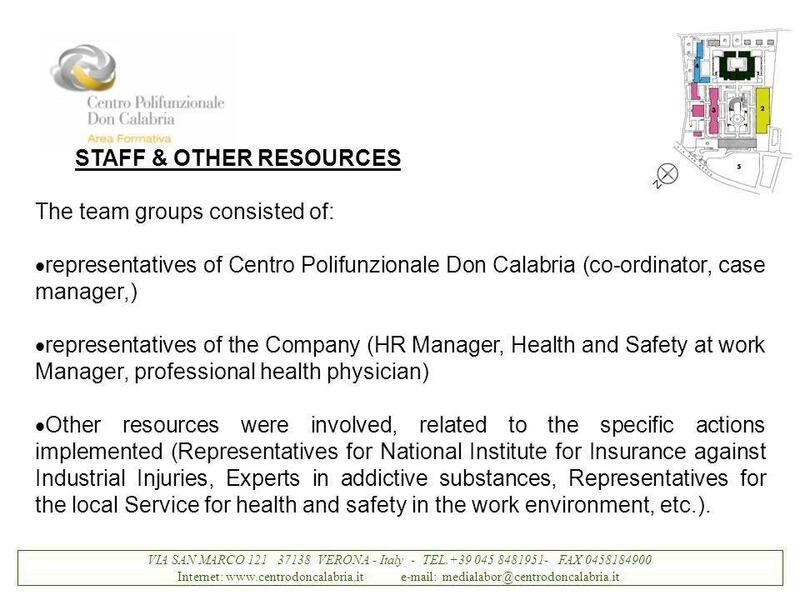 Partners: Azienda ULSS 16 di Padova (Local Health Unit 16 of Padua) – Lead Partner Amministrazione Provinciale di Padova (Provincial Administration of. Vocational Rehabilitation QUEST BRAIN INJURY SERVICES Fleur Colohan Vocational Instructor Elaine Armstrong Head of Brain Injury Services. European Social Fund Evaluation in Italy Stefano Volpi Roma, 03 maggio 2011 Isfol Esf Evaluation Unit Human Resources Policies Evaluation Area Rome, Corso. Dave Moore Head, Health, Safety & Wellbeing 11 March 2015 Santander UK Positive about Mental Health. An introduction to Remploy Mark Lunn Regional Director, London and South-East 23 rd July 2010. REPRESENTING EMPLOYER ORGANIZATIONS THROUGHOUT THE WORLD HOW THE EMPLOYERS ORGANISATIONS CAN INFLUENCE THE PRIORITIES AND OUTCOMES OF DWCPS Presentation. The burden of RMDs on patients and their families The value of early intervention, prevention and better management of RMDs Marios Kouloumas Chairperson. Congress of AVAPES on Rehabilitation and Inclusion Dr. jur. Friedrich Mehrhoff, German Social Accident Insurance, Berlin Sao Paulo, November 2011 “Global. 1 Primary Care Today Conference, May 6-8, 2004 Disabilities Management – Work & Health, Health and Work Presented by: Dr. Lisa Doupe MD DIH DOHS Funded. 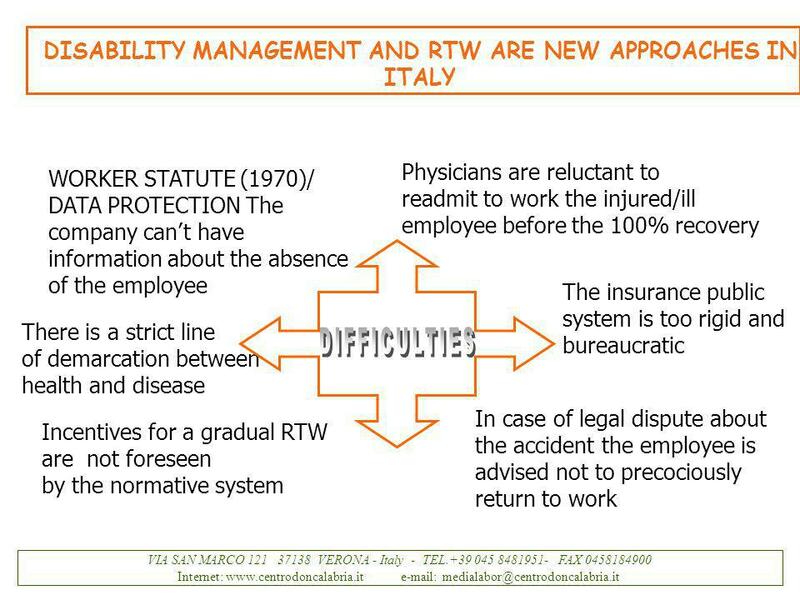 Disability Management Definition: “…the process of preventing and managing absence from work. Operationally, it is an active process directed towards promoting. Is Health Education Important in Schools? Educational Center - Vasto (Italy). WHO WE ARE The Educational Centre plays a valuable service training on prevention of disaffection among young people. 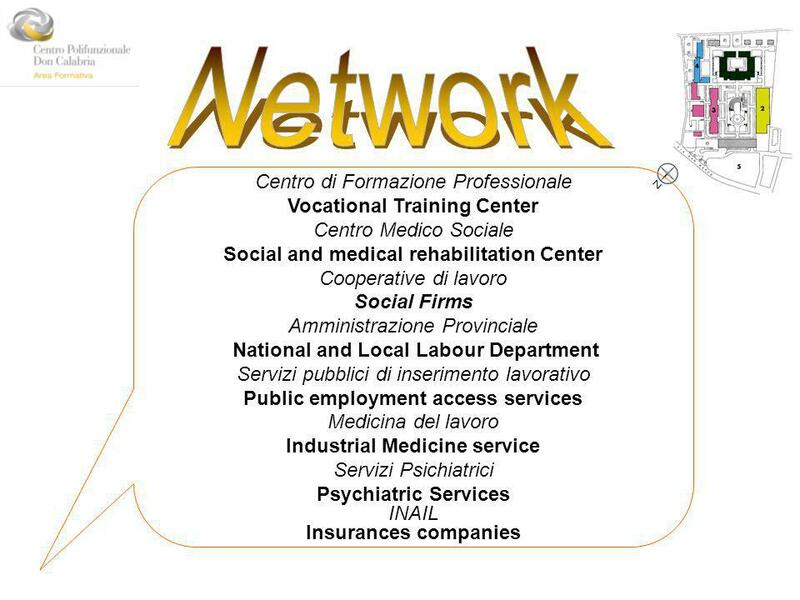 Associazione Lavoro Over 40 Professionalism to compete in changing world Brussels, 5 June EMPLOYMENT. Building a Resilient Organisation. Who We Are Privately owned business Over 24 years experience National footprint Four companies offering - Workplace. Vitri Widyaningsih. TypeAmeliorativePreventive Industrial medicine ( occupational medicine) Acute medical care Disease evaluation Fitness to work evaluation.